Controlling a robot wirelessly is possible with several methods such as Remote, Bluetooth, Wi-Fi, etc. But, the controls of these communication methods are limited to certain areas, and complicated to design as well. To overcome these difficulties, we have come up with a Mobile Controlled Robot. A Mobile Controlled Robot is a mobile device, which provides wide-range of wireless control ability to your robot unless your cell phone gets out of signal. A general concept of mobile controlled robot is that it can be controlled from any part of the world with just an inclusion of a camera. We will definitely offer you the simplest method for developing this kind of robot in the coming days. Now, we like to introduce the simplest technique of fabricating a Mobile Controlled Robot via GSM. As we have eliminated the use of a microcontroller, it could certainly help the beginners to feel better. Components Used: The components used in making this robot are easily available in electronic markets and very cost effective too. The following list provides the complete component requirements of this robot. IC CM8870 – 1 no. 10 µf Capacitors – 2 nos. 0.1 µf Capacitors – 2 nos. 3.58 MHz Oscillator – 1 no. 1K Resistor – 1 no. 100 K Resistor – 2 nos. 300 K Resistor – 1 no. Universal Headphone Jack – 1 no. Attach IC 7805 (Voltage Regulator), and place one 10 µF capacitor in IN & GND connection of IC 7805 and other in GND & OUT connection. To check the power flow path, an LED is given a positive supply via 1K Resistor. Connect 1st & 4th pin of CM8870 (DTMF Receiver) together. Pick one 100K resistor and place one side of it in 2nd pin and other side to the 0.1 µf capacitor. Pick another 100K resistor and connect 3rd and 2nd pin. Provide GND connection to 5th, 6th, and 9th pins. Couple 7th and 8th pins with 3.58 MHz Oscillator. Provide +5V supply to 10th and 18th pins. Take one 300K resistor, and place one side of it to 16th pin and other to 0.1 µf capacitor from 17th pin. Connect 0.1 µf capacitor to the 18th pin. Supply +5V power to 1st, 8th, 9th, and 16th pins. Provide ground connection to 4th, 5th, 12th and 13th pins. Attach 2nd, 7th, 10th, and 15th pins of L293D to 14th, 13th, 12th, and 11th pins of IC CM8870 respectively. There are three different layers in Universal Headphone Jack such as a Sleeve, Tip, and Ring. A closer view of the three layers is shown in the circuit diagram clearly. Connect the sleeve to the output of 0.1 µf capacitor (2nd pin) in the IC CM8870. Provide GND connection to the tip and ring. Working: After completing the construction, connect the circuit with 9V battery. Also, connect the universal headphone jack to its respective cell phone with incoming facility. Activate auto-answer mode in the cell phone before connecting it to the circuit, and enable keypad tones in the cell phone that you use to make calls. Now, your robot is ready to operate wirelessly with GSM facility once you make a call to the cell phone connected to the robot. 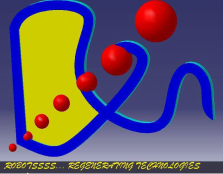 By pressing the number keypads in the your cell phone, you will be able to move the robot in various directions. It is made possible with the help of Dual Tone Multi Frequency receiver (IC CM8870), in which the sleeve connection of the robot cell phone is connected to the IC CM8870. 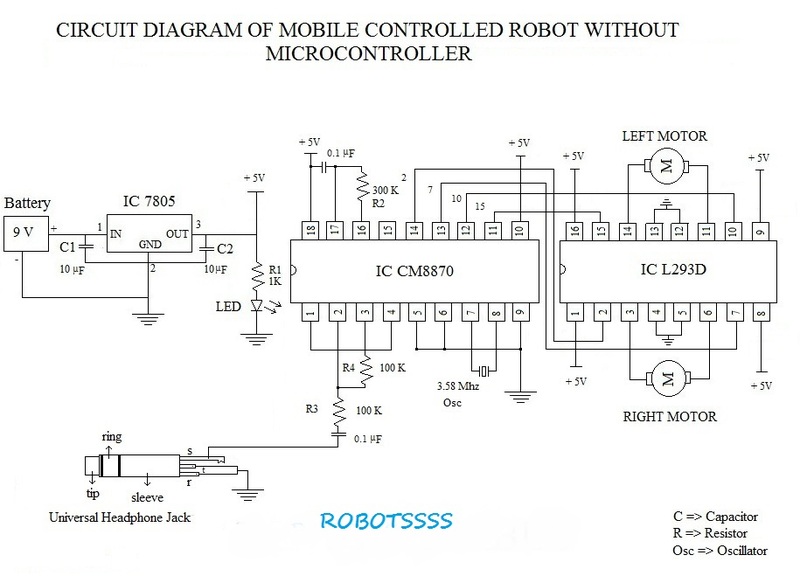 The tone received from your cell phone to the robot cell phone will be converted into binary form, and suitable output is provided by the IC CM8870 to IC L293D. For example, if you press no. 9 in your cell phone, then the robot will move forward (as per this circuit).